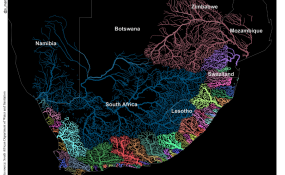 The map showing how water flows through Southern Africa's river basins. And though it didn't start out strictly as "science" - it was created on a whim after seeing a map of US rivers - the map has provided us with valuable insights into how scientists and researchers can use maps to engage with broad audiences beyond the usual journals and conferences. Our hope is that other researchers who want to share knowledge, source information and engage with the public can learn from - and build on - this story of a river map gone viral. Sukhmani Mantel is Senior Research Officer Institute for water research, Rhodes University, and Stephanie Januchowski-Hartley is a Sêr Cymru Research Fellow at Swansea University in the College of Science and Department of BioSciences.